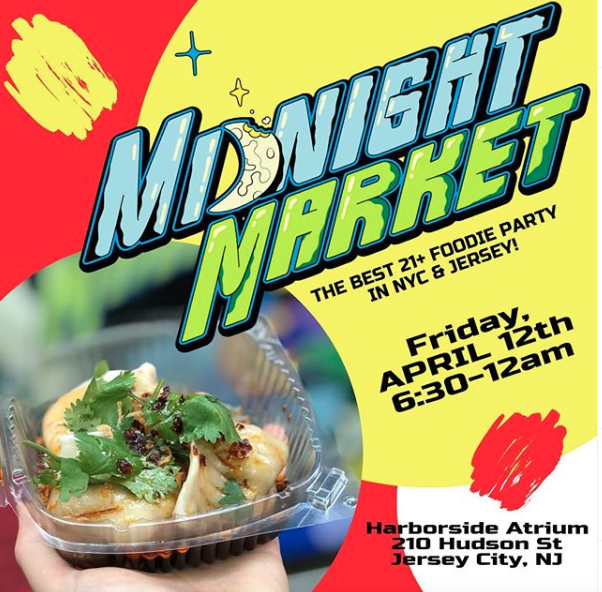 The BEST FOODIE PARTY in the area is back on April 12! $10 Online Ticket Sales: This ticket gets you entry to the event. We reserve the right to establish a wait at the door, depending on capacity. Online ticket holders are given preferred entrance to the event over cash ticket holders. The Belgian Plate by Waffle It & Co. This is a 21+ event only. No person under 21 is permitted to attend. There is limited on street parking and several parking garages. Additionally, there’s access to the venue from the PATH, Light Rail, and NY Waterways. Are tickets available at the door all night? Yes, tickets are available at the door all night. The venue is indoor and subject to capacity laws. Just as with a restaurant, there may be a wait at the door if we are at capacity. Follow @midnightmarketevents to keep up to date with the door.